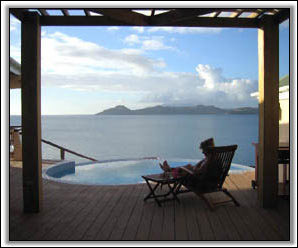 Pelican is an amazing villa loaded with artistic flair located on the most spectacular site on the island of Nevis. This three-bedroom villa is perched on a cliff side overlooking St. Kitts on the west coast of the island in the stunning development called Cliffdwellers. 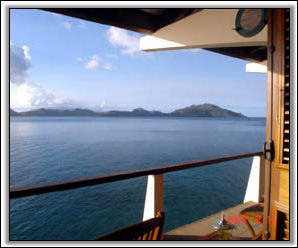 From the front veranda, you’ll think you’re on the deck of a cruise ship. 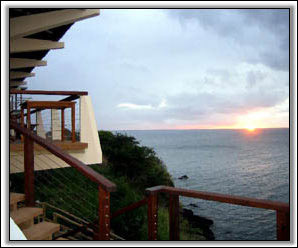 You can watch the pelicans and frigate birds dive by day and waves washing over the rocks will lull you to sleep. 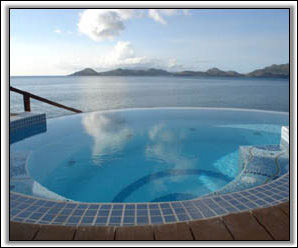 At dusk, there is nothing between you and the Nevis sunset but the deep blue Caribbean sea. The villa is carefully tucked into the side of a hill carved out of rock. The entranceway to the house is lined with handsome hand-built stone walls and walkways, and lush tropical landscaping. The villa is decorated in dazzling colors and handcrafted sinks, mirrors and décor created by mosaic artist Patrizia Salles. The great room includes an open kitchen, living, and dining areas that open to the outside through several sets of handcrafted louvered French doors. There is a queen sleeper sofa in the living room. 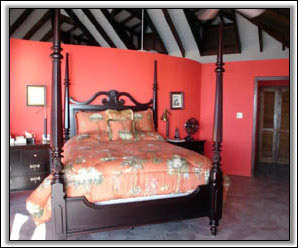 Adjacent to the great room is the hibiscus-colored master bedroom with a colonial West Indian-style queen bed adjacent to a swimmingly-beautiful Caribbean blue bathroom with open-air shower. 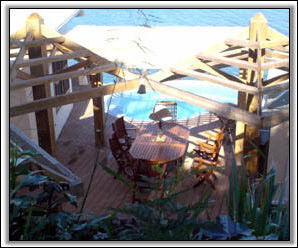 Next to living area is a pergola for outdoor dining, vine-covered umbrella trellises, and wooden decks that surround a nautilus-shaped pool. In the infinity-edged pool, there is seating as well as a standing ledge for enjoying the views. 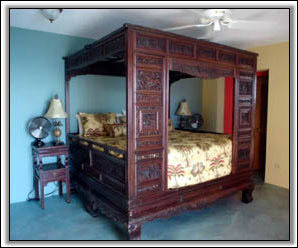 A guest suite is downstairs, outfitted with a 7’ x 7’ carved Chinese Wedding bed with canopy, bathroom, and waterfront veranda overlooking the cliff. 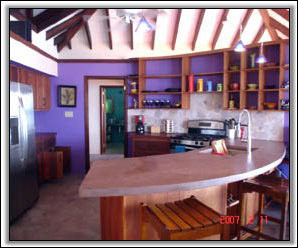 The house has ceiling fans throughout. State-of-the-art electronics are featured in every room with I-pod docking players and high-speed cable Internet connections that are wireless in every room. There is a main stereo with computer Media Center to check e-mail, listen to radio stations from home over the Internet, a Sirius satellite radio, and iPod/MP3 player input for listening to music from home. There is a DVD player to watch movies on a computer screen, which can be switched to Cable TV. The downstairs bedroom will have a DVD/TV/computer monitor screen to be used with a laptop, The guest bedroom has a personal stereo with radio, CD, and iPod/MP3/computer connections. The house is equipped with a free phone system for international calls to the US. or Canada to keep in touch with those left in the cold back home. Rates do not include the required 9% government accommodations tax. VISA, MC, and Discover cards are accepted.